It’s Fall! Let’s Kick off Oyster Season! In an ethereal way, we are all pushed out of our warm and lazy summer days. We wish to hum through our love of summer, but a transition calls. Football will beckon, colors will change, and on the coast, oysters also take the stage. We have a salve to heal the pain of a lost season, and for this angst we have the Oyster Roast. 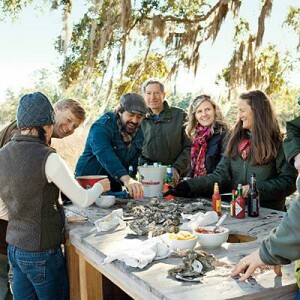 If one has an invitation to a friends backyard, or the opportunity to participate in a generous local business invite, it would be a sad mistake not to take the chance on the Oyster Roast experience. The table will be rustic and functional made for distributing oysters, and discarding shells and always made to accommodate conversation. 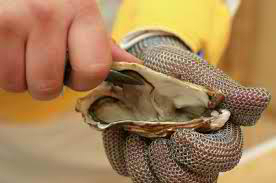 One good glove, and an oyster knife is all you need in the way of utensils. A hospitable oyster roast veteran can help a newbie get started. Sip a beverage, and crack open that oyster shell. Oysters are not about their appearance. They have depth, texture, and dimension. Try all the condiments, cocktail sauce, butter, vinegar, or if the oyster is perfect, nothing at all. As is at the Oyster Roast, so is life.